It started last summer as a challenge made in jest, and yesterday it became a reality. I can still remember the conversation at work last year that led to this madness, when a discussion of the London Marathon led to sarcastic comments of the "I'd love to see Phil doing it" variety. In a fit of pique, I decided to prove them wrong by signing up for the 2010 run, despite my rather unimpressive physical condition. I haven't engaged in any kind of regular exercise since I played football as a teenager – and even then I was a goalkeeper – so I had some serious work to do in order to get myself in shape for this. Last August, I bought some running gear and trainers and set out on my first run. I returned half an hour later, completely knackered and out of breath, and having failed to master a 2-mile jog. This truly was going to be a long, long road. Gradually, however, I began to find my feet. The runs slowly got longer as the weather conditions got worse, and when I completed an 8-mile run in October I felt for the first time that I might be on track to accomplish my goal. It was hard to maintain the motivation and dedication required to keep my training up as the harsh winter weather set in, the snow and ice meant January was almost a complete write-off, and the half marathon I completed in Brighton in February was the absolute nadir of my whole experience, with atrocious conditions from start to finish. At least, I thought, this is as bad as it can possibly get. Ultimately, that proved to be the case, and the rest of my training went relatively smoothly. I have suffered some minor injury worries along the way, mostly with my hip and my calves, which have provided constant niggles, but some careful stretching has helped me minimise those issues. When the day itself finally arrived, I was feeling oddly sanguine about the prospect of running 26.2 miles. The weather predictions were totally wide of the mark, and the anticipated scorching heat didn't materialise as the race started in chilly, wet conditions, but having trained in such weather for months, that probably suited me better. I breezed through the first half of the marathon with relative ease, maintaining a steady pace throughout and feeling pretty good about it all. The second half of the race, however, was much more of a challenge. Miles 15 to 20 took us around the Isle of Dogs/Canary Wharf area, and that's where I first started to feel the heat – literally, in fact, as this was where the sun finally started to break through the clouds. I was holding up a lot better than some competitors, though; it's an unsettling sight when you run past people lying on the ground in agony, or being carted off on a stretcher and wearing an oxygen mask. To be honest, the marathon is as much a mental challenge as a physical one, and when my fatigued legs started telling me that they wanted to quit it took every ounce of my determination to force myself onwards. All the while, I was terrified of one thing – The Wall. Runners talk of "hitting the wall" in the same hushed, haunted tones as a war veteran recalling terrible events, and now I know what they mean. I ran straight into that wall at the 22-mile mark, and I honestly feared that I would have to throw in the towel. I simply had nothing left to give, and I could see people dropping out around me, but I had promised myself that I would keep going unless I completely keeled over. I couldn't let my charity down; I couldn't let my friends and family down; I couldn't let myself down. The other thing that carried me onwards was the magnificent support of the spectators who lined the entire route. Their cheers and shouts of encouragement gave the runners a huge lift just when they needed it most, and when I got into the last two miles, I somehow found a second wind. The last 400 metres was like nothing I've ever experienced, when I could see the finish in front of me and was being spurred on by the crowd. I looked at the clock and realised I was so close to beating my 5-hour target, which gave me the motivation to really push myself in that final stretch, crossing the line in 04:53:42. Throughout the past few months, people having been telling me that this won't be my last marathon, and that I would inevitably get hooked on running. Alas, it hasn't happened, and I have never really enjoyed the whole process as much as others seem to. Every training run has felt like a chore, and now it's all over I'm just looking forward to getting my life back. Having said that, it was ultimately worth it for yesterday's experience. 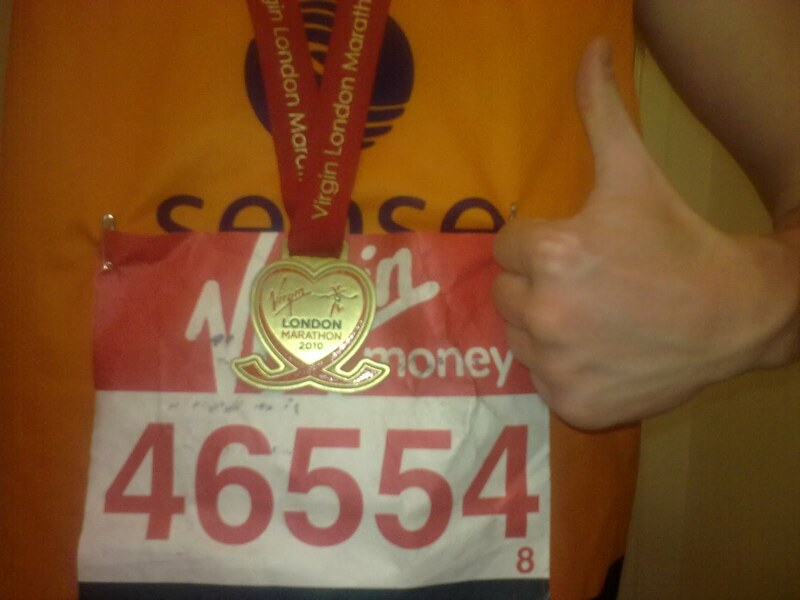 Running the London Marathon might have been the toughest thing I've ever done, but feeling of finishing it was incredible – I don't think I can sufficiently describe the overwhelming sense of relief, elation and pride that I felt stepping over that line. It was one of the most extraordinary experiences of my life, and one I'll never forget. I'm now rather sore – well, to be more accurate, everything hurts – but I'm comforted by the knowledge that while the pain will eventually go away, the memories and sense of achievement will last a lot longer.